This Backyard pond is a perfect example of the block waterfall pond design. The block will hold the back of the waterfall as well as the pond itself. Using one pond liner to line the entire pond and waterfall is the ideal. This way you can ensure there will be no leaks. Although this is a commercial pond installation located at Sunland Water Gardens it would be quite happy as a backyard pond with a waterfall. The waterfall is made from two drops coming from two bowls. The bowls are deep enough to add small aquatic plants like water hyacinth or bog plants like cattails or arrowhead. As the finishing touches to this pond construction we faced the block with rock and the tops with flagstone as a seat. Having a built in seat makes it easy to enjoy your waterscape in comfort. 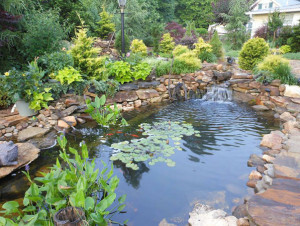 It is good when planning your pond design to make sure you are remembering areas for each of your desired pond plants. If you have predators like raccoon’s it is recommended to not have shelves and make your sides at least 2 feet deep. Pond Construction is easy if you plan ahead. Do you what plants? Do you want Koi? Or maybe both? Are you in the sun or shade? How much pond maintenance do you want to do verses how much you want to spend on pond filtration? These are good things you need to know before you call your pond builder. 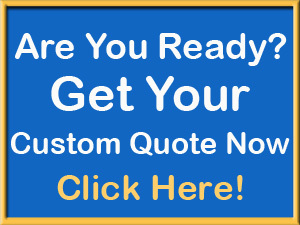 Pond Construction Contractors – Expert Koi Pond Builders!